Well, maybe not entirely. Outside it’s currently overcast, 27 degrees and snowing. 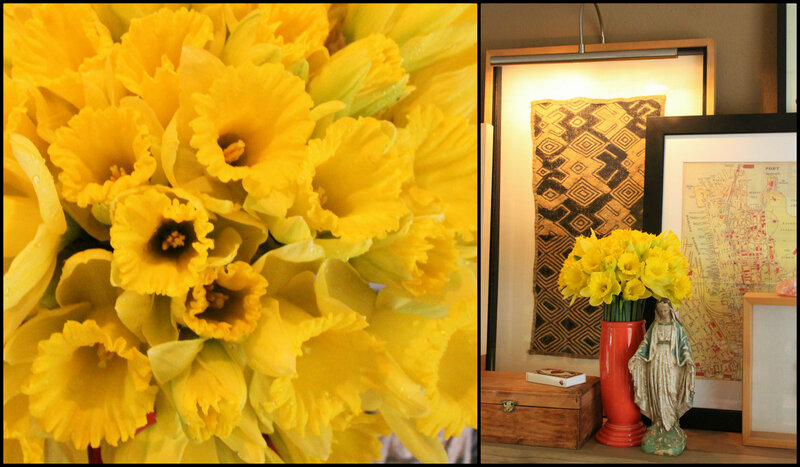 But I know a secret to make it feel more like spring inside. “Is that asparagus?” Jamie says. I’ll admit, they aren’t very attractive looking, and I know most people don’t even notice them. But I know what they can do, and at $1.99 a bundle…..What’s to loose? 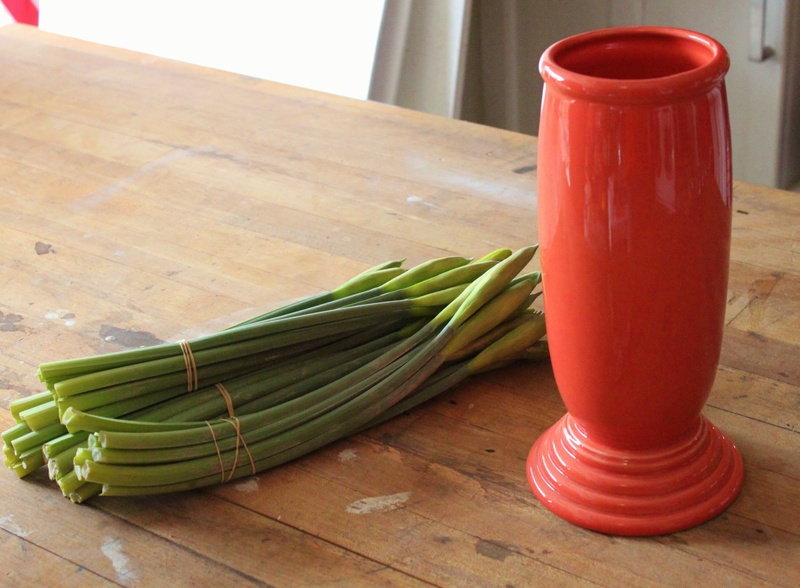 All I need is a vase…..
Just clip each stem at a 45 degree angle with the clippers. 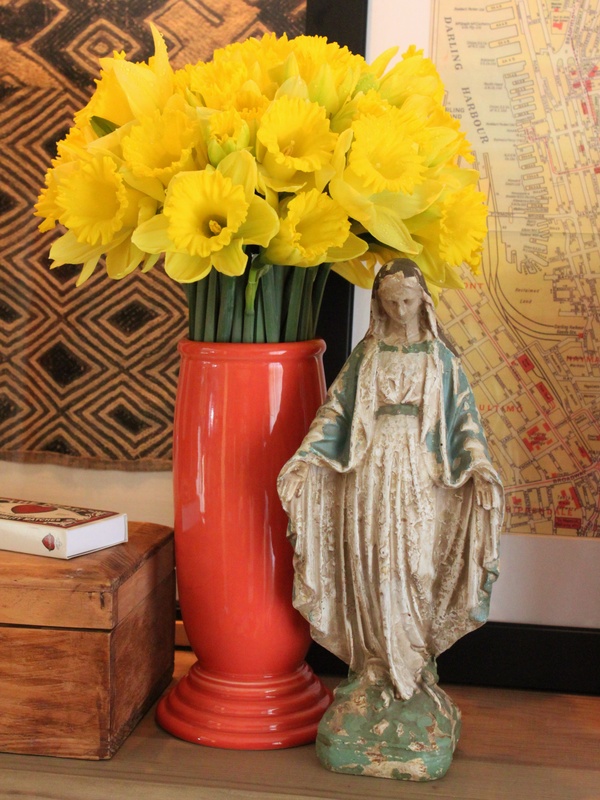 Then arrange them in a good-sized vase filled with cool water. 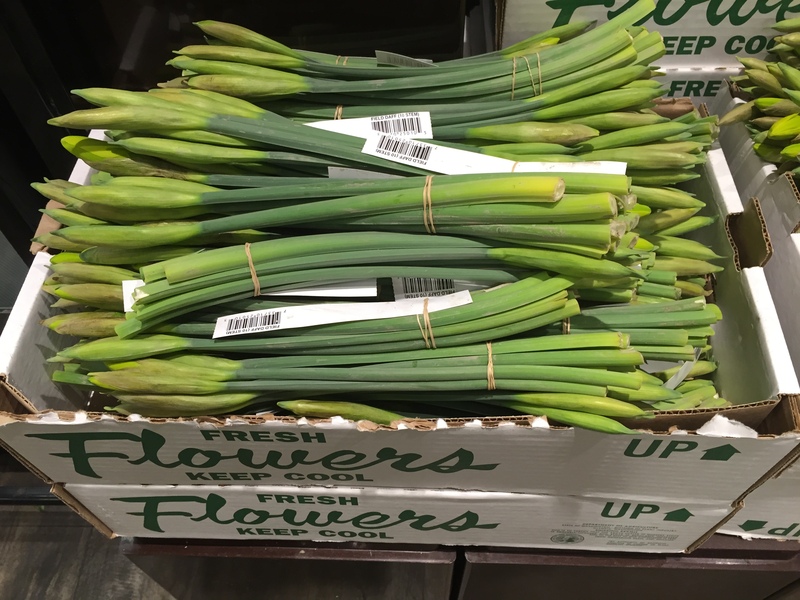 Shorter ones on the edges; and taller ones towards the middle. 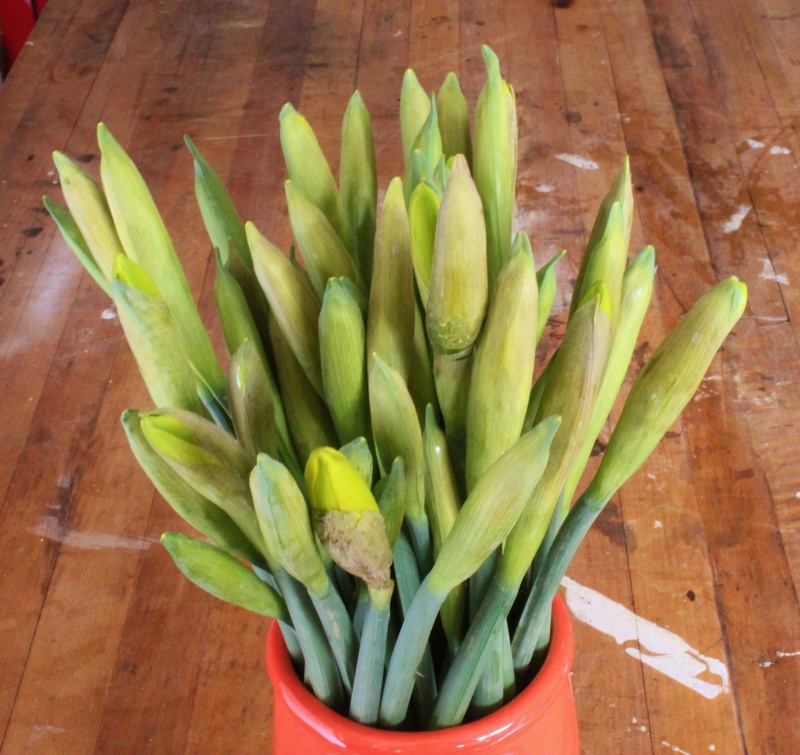 The flowers immediately soak up the water……5 minutes later some of them are already starting to pop open. 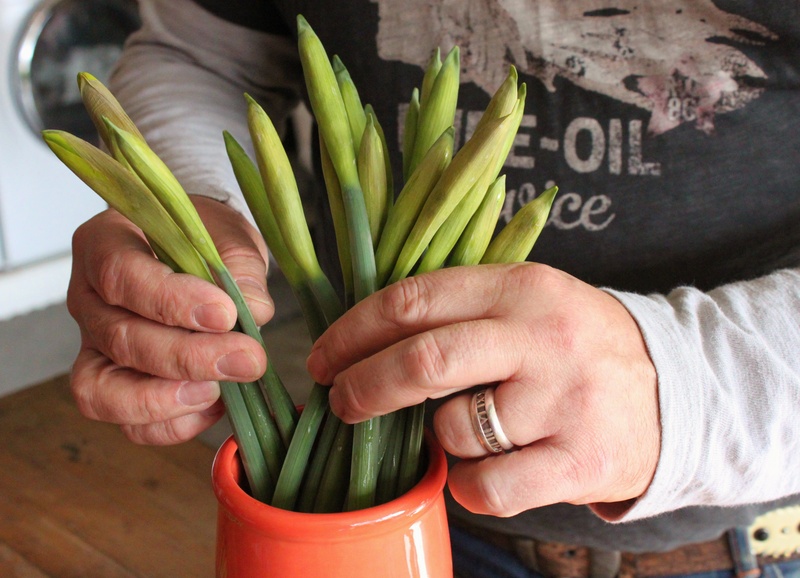 Cut daffodils will only last a few days….. But what a bright, sunny couple of days they are. Ever wonder why cowboy hats are called “10 gallon”? 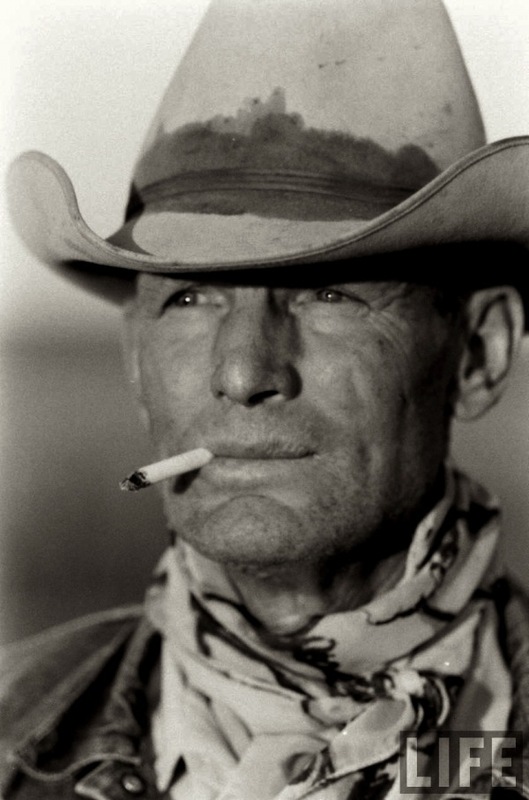 When Mexican vaqueros described the hats they wore as tan galan (So Elegant in Spanish), the Texas cowboys – who had also started wearing them for sun protection – misunderstood…..and the required hat for cowboys became known as a “Ten-Gallon” hat. They actually hold about 3 quarts. I was just too stupid to realize it. For Christmas our sophomore year she gave me one of the best presents I’ve ever received. A fleece sweat suit with “JIM SUIT” in iron-on letters across the chest and my last name “ANGUS” running down the pant leg. In the years before “JUICY” or “PINK” guys on the track team would label the butts of their track pants with their last names so everyone trailing behind them would know who was in the lead. She knew that I was fascinated by this fact. But since my last name is one letter bonus of a none-too-pleasant anatomical term, Deanna decided that the leg, and not the seat, was a better place for ANgUS to be placed. I think she made a wise decision. To this day, Deanna is the only person ever to draw me, and in a flattering way no less. 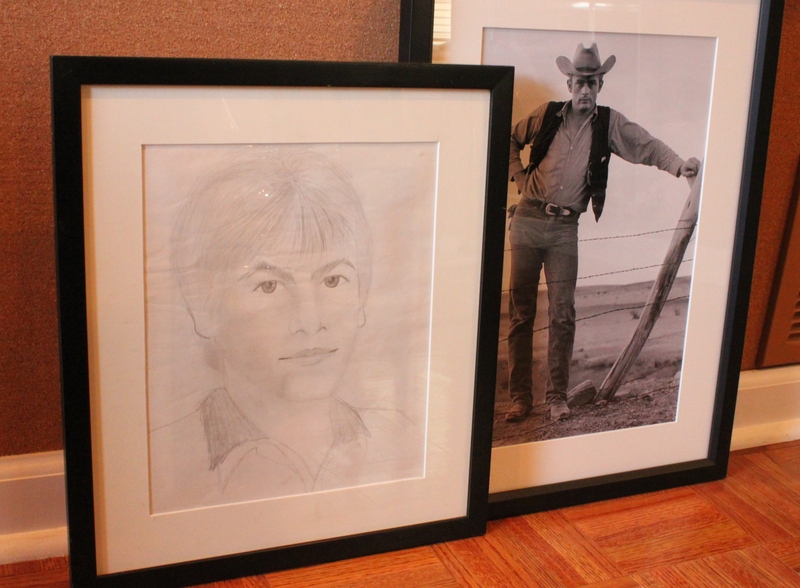 I still have it too, framed in the hallway next too James Dean. We sat next to each other in class (so we could pass notes back and forth), ate lunch together every day, and talked on the phone for a few hours every night before we fell asleep. So we were friends, Right? When it came time for our Sophomore Valentine’s Dance, Deanna was the obvious choice for a date. And why not? She would be fun. But for some unknown reason, I got the idea to double date with someone. Pete played guitar in a band. The freaking guitar. I could barely play a clarinet. I don’t remember his band’s name, them ever playing any gigs, or even who the lead singer was. All I do remember was the 4 of them always doing photo shoots. Lots of photo shoots. 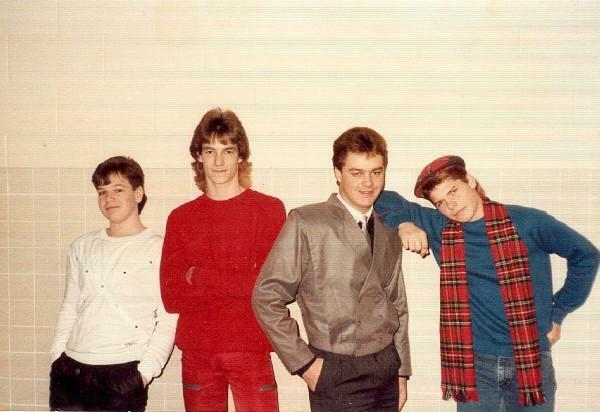 (It wasn’t even a challenge to find this one on my hard drive) That’s Pete in the middle – always the Sharp Dressed Man – in the cropped silver jacket trying desperately to look like Simon Le Bon. Ohhh, and did I mention that Pete was the best-smelling guy I knew? 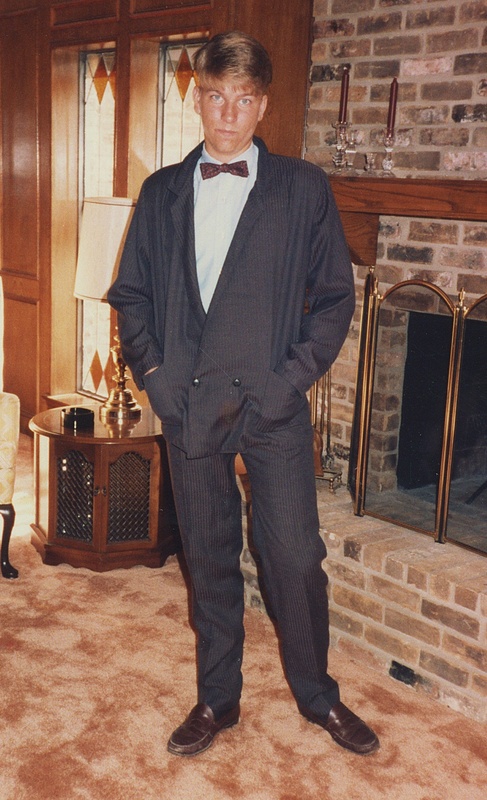 My only suit came from Chess King, or Merry Go Round….or one of those other 80’s men’s stores that sounded like a party game. It was unlined with brown and maroon stripes and a double-breasted jacket that buttoned real low. I wore it with an inch-wide bow tie and the dressiest shoes that I owned at the time……Bass Weejun penny loafers (unpolished apparently). I thought I looked like Kevin Bacon in Footloose. Deanna and I met at the dance at pretty much exactly the same time. 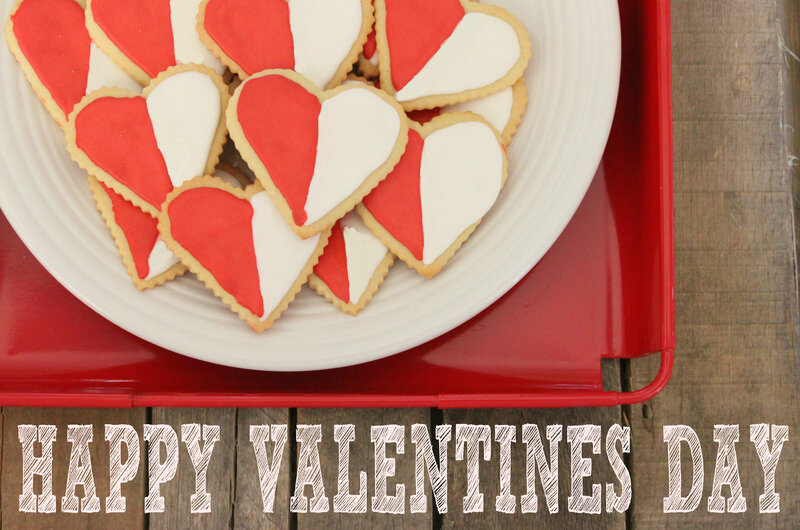 She had a card for me….I didn’t have one for her. I didn’t realize that we were doing that. We hung out with a gaggle of our mutual friends, drank punch, and danced a little. We had our picture taken by the photographer. And can you believe this? I can’t find it. Me. I keep everything. I thought we were having a pretty good time, at least until we separated from the heard. I didn’t have my driver’s license yet, and wouldn’t for another 5 years, but that’s a story in itself, so after the dance my Mother drove me and Deanna, and Pete and his date Penny, (How come I’d never heard of Penny before?) to my favorite restaurant at the time…….Chili’s. My Mother slipped me a 20 (I’m sure in 1963 it would have bought a magnificent steak dinner, a carriage ride once around the park and a pack of smokes. In 1985 it barely bought 2 burgers and a shared order of fries.) and we 4 minors were led to a back both while my mother occupied herself at the bar with a book and – I know she will deny this – a pack of smokes. Our waitress and Deanna knew each other – from church, I think – so Pete seized the opportunity and boldly ordered us a round of strawberry margaritas. I think he was probably joking, or maybe just testing the waters, but she gave him a little smile and brought us actual strawberry margaritas. Not the “virgin” kind that I was expecting. WOW. That had never happened before. I wasn’t sure quite what to do with my margarita, but Pete and Penny certainly did. They had both torpedoed theirs and were slurping up the remaining strawberry pulp in seconds. Pete belched like he was calling the hogs to dinner and Penny, (who was this chick anyway? ), started giggling. Pete, his confidence tequila-enhanced, bellowed across the restaurant for another round. While Deanna and I were still twirling at our first ones with our straws, Pete and Penny had guzzled down their second margaritas (were they immune to the brain-freeze?) and both helped themselves to our untouched seconds without even asking. I don’t remember any of us eating, at all. But we should have because by now Pete and Penny were both drunk. The kind of drunk that 16-year-olds get from drinking 3 Chili’s strawberry margaritas in about 8 minutes. I’m not really sure just what the alcohol content was, but it must have been a lot because Penny couldn’t stop giggling. And the more Pete drank, the louder he got. He was wildly gesturing all the details about the 3rd time he was almost arrested when he knocked his water into Deanna’s lap. That’s when I realized that maybe we should go before the “going” got any messier. 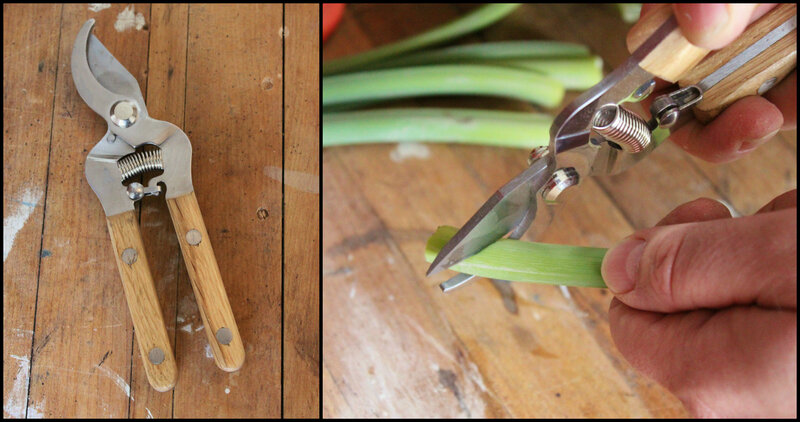 I threw down my 20, rustled up my mother and herded everyone out to her Cadillac…….and the car wouldn’t start. My Mother called a friend on the pay phone by the restrooms, (yeah, they used to have those) and after a very long 20 minutes of Pete explaining exactly how to get high off of silver spray paint my Mom’s friend Shirley pulled up in her van. But It wasn’t a regular van, it was a kind of service van with no seats, just a love seat in the very back…….With the adults in the 2 front seats, we 4 kids piled into the back of the van and squeezed ourselves onto the 2-person love seat, Deanna and I book-ending the tipsy twins…..From somewhere a blanket had appeared and Pete/Penny were immediately buried under it. Why, oh why, was there a blanket in the back of that van? From under the thin fabric we heard slurping, something snapped, more slurping, Pete belched, Penny giggled, and then we heard what sounded like one of them breathing with the assistance of a scuba tank. Darth Vader-esque. I had no idea who. Deanna and I didn’t say much. What was there to talk about at this point? We just each concentrated on what was outside our respective windows for the rest of the ride. Luckily for her, her house was the first stop. If that wasn’t just the cherry on top of her evening. Without saying a word, Deanna went inside and flipped off the porch light. What the hell was that? Was I crazy? Nervous? Aware that my Mother and her friend were pretending not to watch us? Possibly gay? Maybe a little of all of the above. I was sulking back to the van when Pete hollered out the window, “Dude, why didn’t you kiss her? You know she wanted it”. At what point did my teen angst suddenly become more interesting to him than what he was being offered under that blanket? I sunk into the love seat next to the 2 of them, who had returned to their unseen slurping/breathing/giggling rhythm, and endured the rest of the ride. This is when I realized that I left the card Deanna gave me at Chili’s. Deanna never drew me again after that night, she definitely put me in her “friend column”. I didn’t blame her one bit. I know now, even if I didn’t know then, that wasn’t exactly the evening that she was expecting. We joked about that night at our last class reunion, even recreated the missing dance photo. I don’t remember Pete ever smelling good after that night. I few years ago, he and I reconnected on Facebook, he’s divorced and living in Colorado now, and I reminded him of that fateful night in my life………and how I’ve been telling the story ever since. He remembered none of it. Apparently we live in a cottage. According to Wikipedia; A cottage is, typically, a small, charming house. 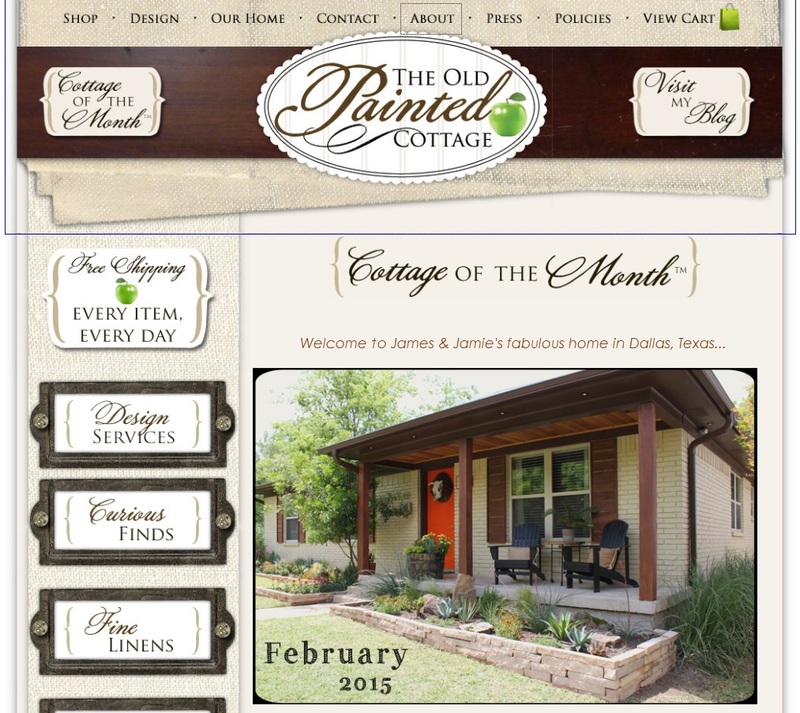 Anyhoo, check out our Cottage of the Month feature at The Old Painted Cotttage. Just reminds me that we need to work on a bathroom….soon. 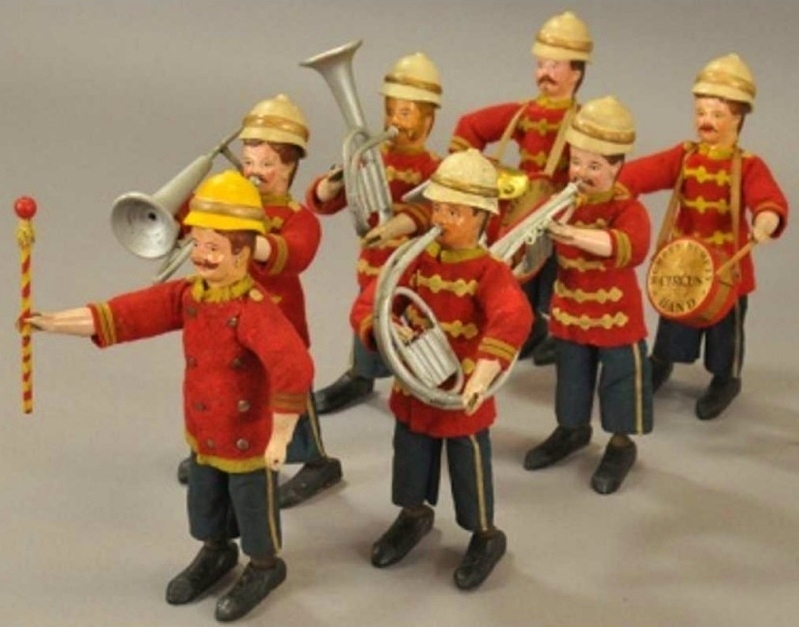 In the days before toys were based on cartoons, sci-fi movies, and breakfast cereals…….toy makers had to actually be creative. 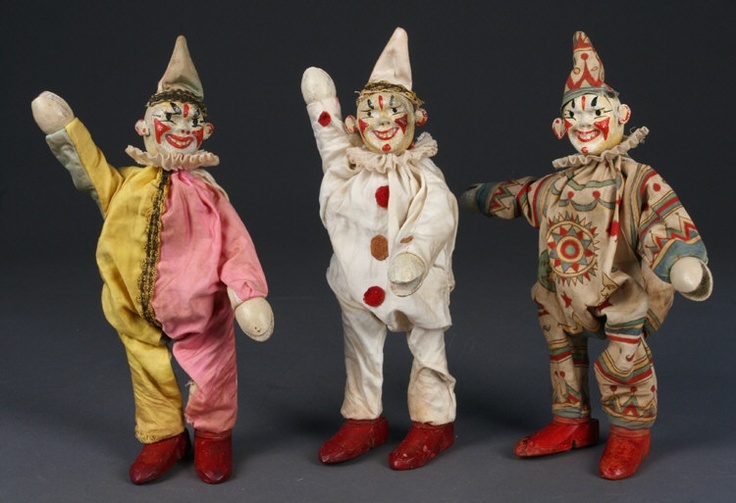 In 1903, Albert Schoenhut debuted his Humpty Dumpty clown toy. 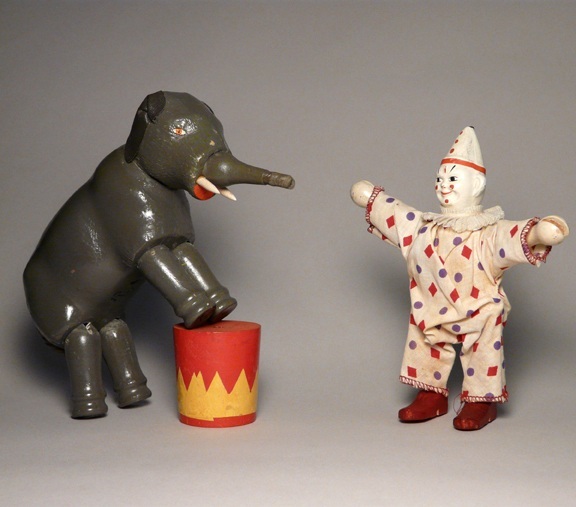 He modeled the toy after the popular play and clown at the time, Humpty Dumpty. 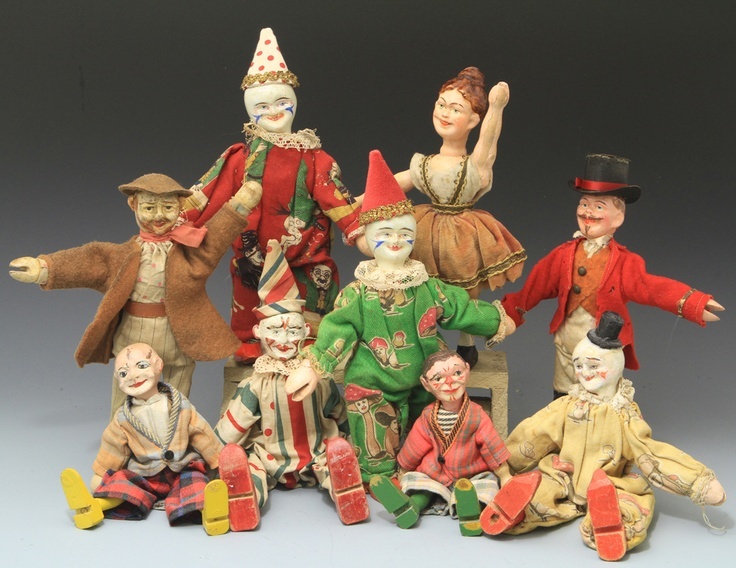 Until that time, Schoenhut made toy pianos, dolls and wooden blocks. 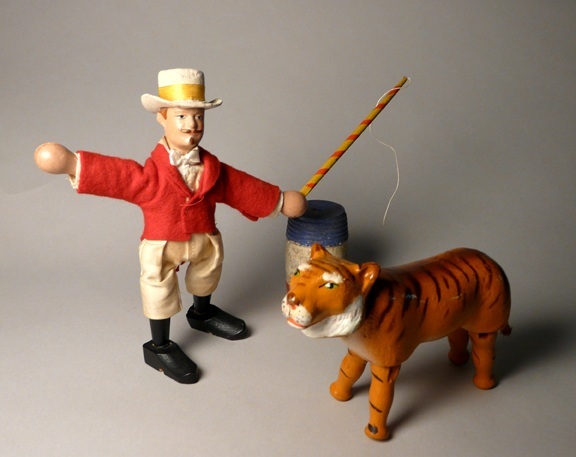 His toy clown was so successful that within a year he had snowballed into a complete line of circus toys. 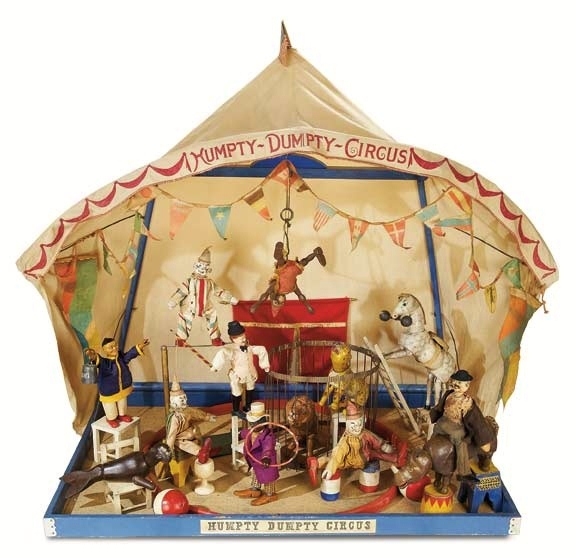 The Humpty Dumpty Toy Circus. 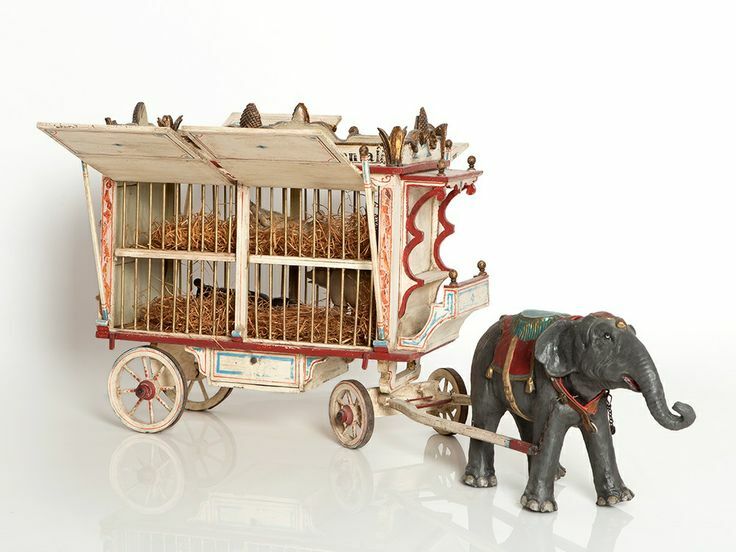 Over the next 30 years, Schoenhut continued to build his circus line to include a ringmaster, lion tamers, carnival wagons, tents, a complete orchestra, minstrels and acrobats, way too many clowns and a full menagerie of exotic animals. 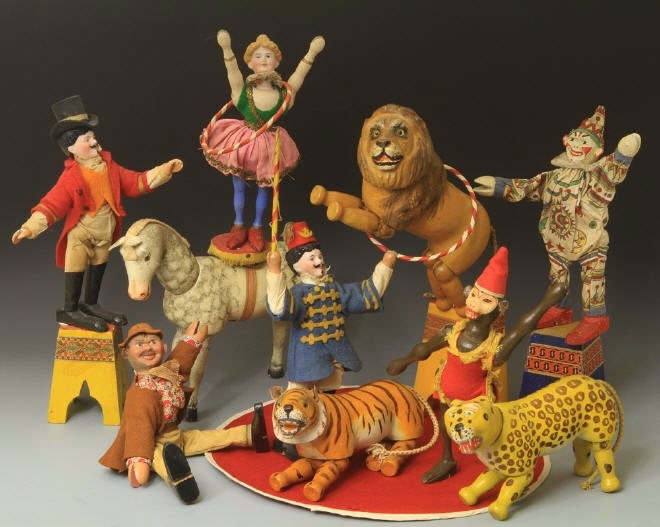 Almost all of the figures were fully poseable with slots in their feet so they could climb ladders, swing on trapeze, or ride on the back of a mount. 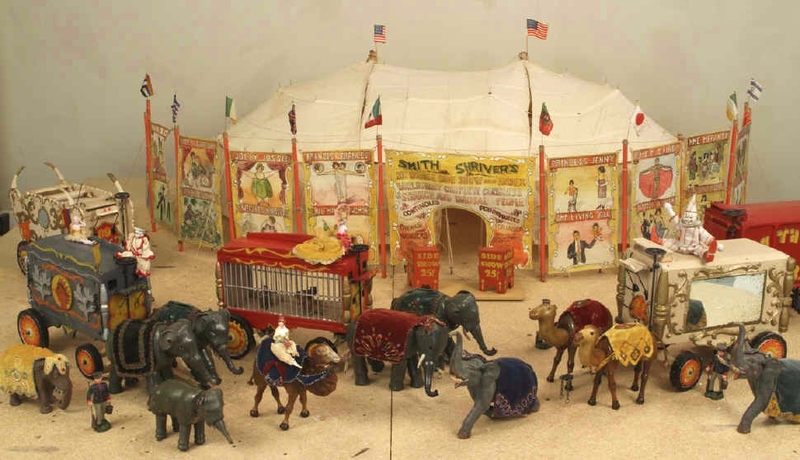 (There were hundreds of traveling circuses crisscrossing the country then; reaching their peak in popularity in about 1910. 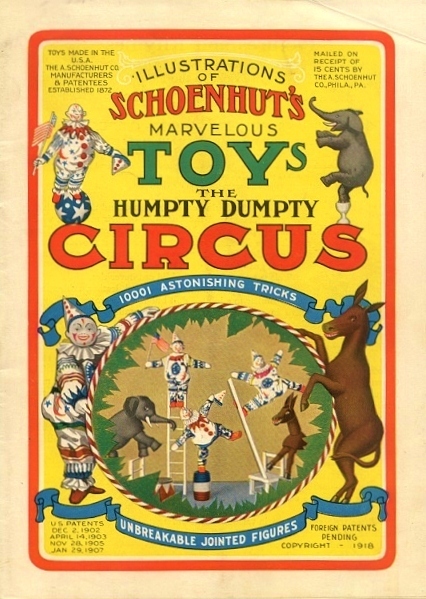 Unfortunately, the Schoenhut company wasn’t strong enough to last through the depression, and closed forever in 1935. 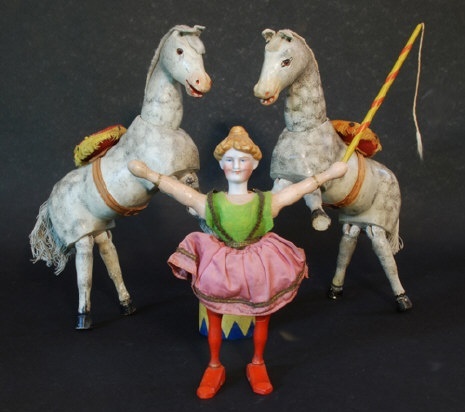 I’ve been fascinated by these toys since I first saw a few figures in an antique store cabinet. When I stumbled on some images from this fantastic toy line, I just new I had to share them with y’all.